Sure, we all know the basics of feeding another person..but there are some parts of this skill that you may not have really paid attention to. 1) don’t close the privacy curtain 2) you are graded on sitting and having a conversation 3) offer a drink before feeding and every 2-3 bites 4) offer the patient a hand wipe for ritual to stimulate appetite 5) feed slow, spoon only half full 6) don’t use plane, train or automobile sounds and 7) you MUST document at the end. So, yes, spooning food into a mouth is pretty simple, but these other steps are testing checkpoints and VERY important! Not all patients will have to be fed, it depends on their circumstances. So, how do we know what we are supposed to do? Read the care plan! See that little red button above the video? That is the care plan for the state exam. Click on it. Go ahead, I’ll wait. You are graded on reading and following the care plan – it counts big! 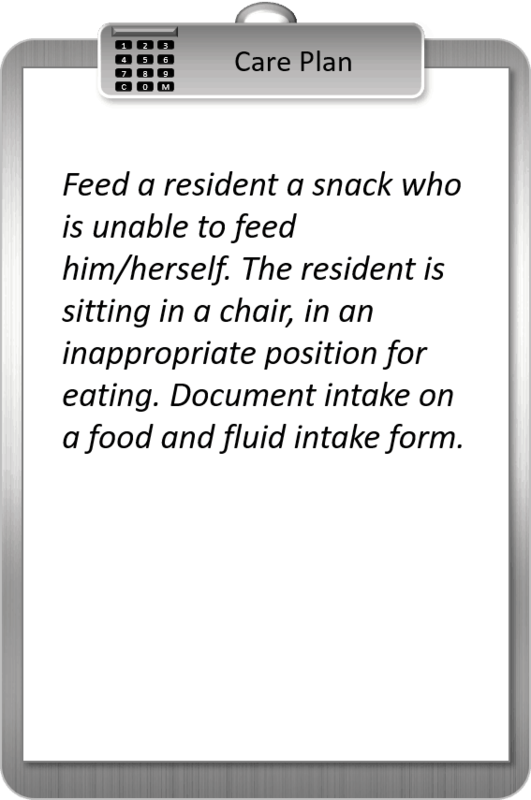 This care plan tells us that the patient is in an inappropriate position for feeding, so you MUST ask them to sit up straight before starting. Since you – as a CNA – can’t decide what the patient needs, your job is to read and follow the care plan. Always read and follow the care plan!